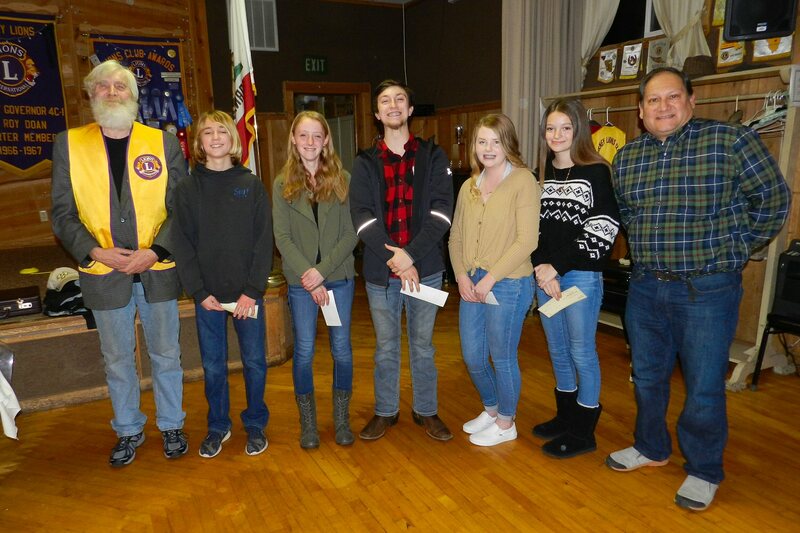 On Thursday evening, January 17, the Burney Lions Club recognized six students for their achievements as Student of the Month. Owen Von Schalsha was named 8th grade Student of the Month for November. Deborah Ford was named 12th grade Student of the Month for November. Ciera McClung was named 8th grade Student of the Month for December. Sierra Outcalt was named 12th grade Student of the Month for December. Sierra was unable to attend the ceremony but was recognized in her absence. Morghan Herring was named 8th grade student of the Month for January, and Noah Bishop was named 12th grade Student of the Month for January. The students were introduced by BHS Principal Ray Guerrero. Mr. Guerrero commended each student for maintaining a high grade point average and for their outstanding participation in school clubs, sports, and community activities. Each student introduced parents and family members who came to watch them receive their award and the parents gave brief comments praising their children and thanking the Lions. Lion George Whitfield presented each student with a check from the Burney Lions Club. 8th Grade Students of the Month each received $50. 12th Grade Students of the Month each received $100.